Knockout Tested Mouse monoclonal PGP9.5 antibody [13C4 / I3C4]. Validated in WB, IHC, ICC, ICC/IF and tested in Mouse, Rat, Sheep, Rabbit, Guinea pig, Dog, Human, Pig, Zebrafish. 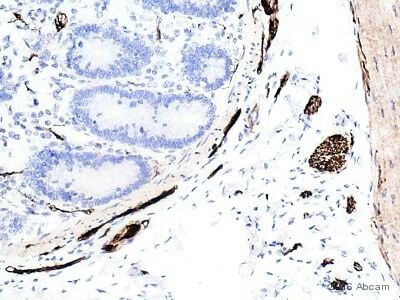 This antibody reacts with human neuroendocrine marker PGP 9.5. PGP 9.5 from human brain. 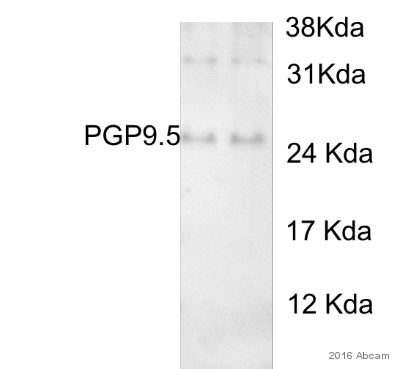 In Western Blot, ab8189 gave a positive signal in the following lysates: human, mouse and rat brain tissue; rat cortex tissue; human spinal cord tissue; SHSY5Y whole cell. 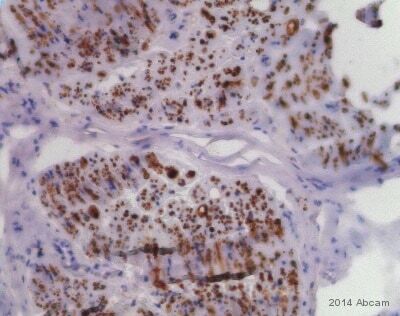 This antibody also gave a positive result in IHC in the following FFPE tissue: Rat normal pancreas. This antibody labels the neuronal cell bodies and axons in central and peripheral neural system. Small nerve fibers in peripheral tissues, neuroendocrine cells in normal pituitary thyroid, pancreas, and gastrointestinal tract, as well as derived tumors are also stained with this antibody. Some batches contain L-Arginine or BSA as a stabilizing agent. For lot-specific buffer information, please contact our Scientific Support team. Our Abpromise guarantee covers the use of ab8189 in the following tested applications. WB Use a concentration of 5 µg/ml. Detects a band of approximately 25 kDa (predicted molecular weight: 25 kDa). Found in neuronal cell bodies and processes throughout the neocortex (at protein level). 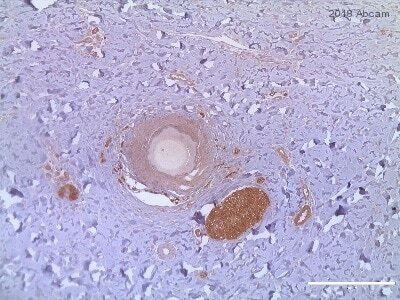 Expressed in neurons and cells of the diffuse neuroendocrine system and their tumors. Weakly expressed in ovary. Down-regulated in brains from Parkinson disease and Alzheimer disease patients. Belongs to the peptidase C12 family. Cytoplasm. Endoplasmic reticulum membrane. About 30% of total UCHL1 is associated with membranes in brain. 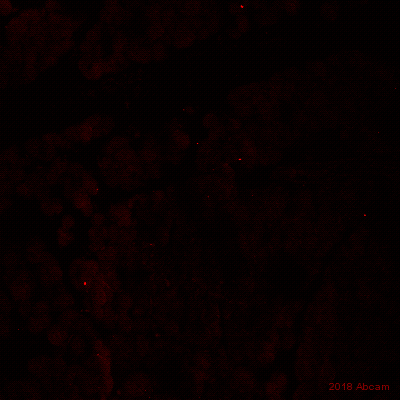 IHC-P image of PGP9.5 staining on P5 mouse skin sections using ab8189 (1:1000). The sections were de paraffinized and subjected to heat meadiated antigen retrieval using citric acid. The sections were then blocked using 1% BSA for 10 mins at 21°C. ab8189 was then incubated for 16 hours at 21°C. the secondary antibidy used was Got polyclonal to anti mouse IgG conjugated to biotin (1:200). Lanes 1 - 4: Merged signal (red and green). Green - ab8189 observed at 25 kDa. Red - loading control, ab181602, observed at 37 kDa. ab8189 was shown to specifically react with PGP9.5 in wild-type HAP1 cells as signal was lost in PGP9.5 knockout cells. Wild-type and PGP9.5 knockout samples were subjected to SDS-PAGE. ab8189 and ab181602 (Rabbit anti-GAPDH loading control) were incubated overnight at 4°C at 5 μg/ml and 1/20000 dilution respectively. Blots were developed with Goat anti-Mouse IgG H&L (IRDye® 800CW) preabsorbed ab216772 and Goat anti-Rabbit IgG H&L (IRDye® 680RD) preabsorbed ab216777 secondary antibodies at 1/20000 dilution for 1 hour at room temperature before imaging. 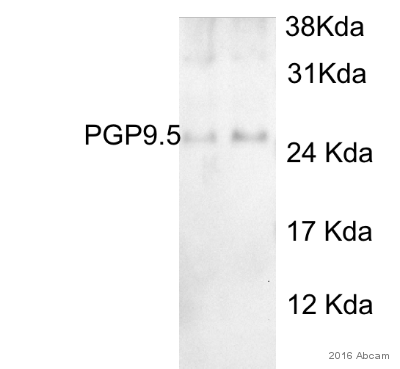 This blot was produced using a 10% Bis-tris gel under the MES buffer system. The gel was run at 200V for 35 minutes before being transferred onto a Nitrocellulose membrane at 30V for 70 minutes. The membrane was then blocked for an hour using 5% Bovine Serum Albumin before being incubated with ab8189 overnight at 4°C. Antibody binding was detected using an anti-rabbit antibody conjugated to HRP, and visualised using ECL development solution. ab8189 (1/20) immunostaining neurons in mouse cortical primary cell culture. IHC-P image of PGP9.5 staining on zebrafish brain using ab8189 (1:1000). The sections were subjected to heat mediated antigen retrieval using citric acid. The sections were then blocked using 1% BSA for 10 mins for 21°C. The primary antibody (ab8189) was incubated at a dilution of 1:1000 at 21°C for 16 hours. The secondary antibody used was undiluted goat polyclonal to Mouse IgG conjugated to biotin. 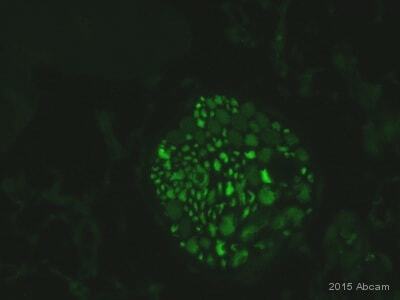 IHC image of PGP9.5 staining in Rat pancreas formalin fixed paraffin embedded tissue section, performed on a Leica BondTM system using the standard protocol F. The section was pre-treated using heat mediated antigen retrieval with sodium citrate buffer (pH6, epitope retrieval solution 1) for 20 mins. The section was then incubated with ab8189, 0.02µg/ml, for 15 mins at room temperature and detected using an HRP conjugated compact polymer system. DAB was used as the chromogen. The section was then counterstained with haematoxylin and mounted with DPX. Publishing research using ab8189? Please let us know so that we can cite the reference in this datasheet.